Wharton Executive Education offers senior leaders four remarkable programs that enhance leadership skills and advance business acumen in key areas such as finance, marketing, and strategy. Our programs are selective and designed specifically for executives seeking new ways to influence and effect change within their organizations. 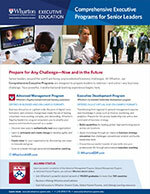 Personalized executive coaching is offered in all of Wharton’s Comprehensive Executive Programs. Wharton’s Lynn Krage explains the three factors that lead to coaching success. Technology, globalization, and constant change have made the job of leading a business more exciting, complex, and demanding. If you are leading, or are in line to lead your firm, Wharton’s flagship program empowers you to define and act on your purpose as a leader and strengthen your strategic prowess. Receive alumni status. Transitioning from functional, unit, or regional management to general management requires knowledge in areas such as finance, marketing, leadership, and strategy. This program prepares you for the complexities of organizational dynamics, communication, and leadership.